The KRONOS music workstation was unveiled in 2011. Everyone who experiences its sound reacts with astonishment at how far electronic musical instruments have come --- followed, no doubt, by the thought "what can possibly follow this?!" 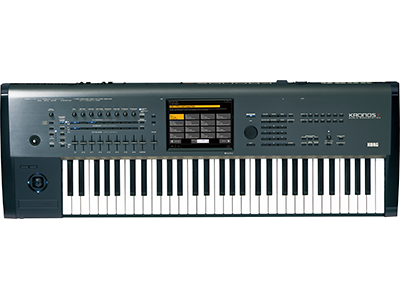 But, in the year since its inception, KORG has continued to release system updates and additional KRONOS Sound Libraries, bringing the KRONOS to an even higher state of perfection. Rather than resting on its laurels in 2012, the KRONOS continued to evolve. Boosting its internal memory capacity and the size of its SSD, as well as enhancing its sampler functionality, we have included more of the latest technology in order to make the KRONOS the ultimate workstation. Fittingly, its new name adds an "X" to indicate its unknown potential. Ready to take off into the unknown future of sound we present the KRONOS X music workstation. A peerless synthesizer containing nine sound engines, including: realistic piano, richly expressive electric piano, tonewheel organ, digital synthesis, and powerful analog/physical modeling. Approximately 2GB of available PCM RAM and a doubled SSD capacity of 62 GB allow support for gigantic sound library expansions, such as the KRONOS Sound Libraries and the KARO Sound Libraries. The user Sample Bank feature allows users to create extremely large sample libraries that take advantage of the generous PCM RAM and SSD capacity. Numerous artist signature sounds created by top musicians are included, letting you make the sounds of classic songs your very own. 73 and 88 key models feature Korg’s finest RH3 Graded Hammer Action. For the biggest tour in the world -- only one synth will do. Here we catch up with Jon Shone , Musical Director with One Direction who tells us about playing keys to 75,000 people a night and how the Kronos is an integral part of this tour. Sixteen new titles from sound developers KApro are now available for immediate download and purchase. Fourteen EXs sample libraries include digital and analog synths (plus a dedicated “talking synths” library! ), orchestral mallets and plucked strings, and a massive collection of pianos, including early pianos as used by Mozart and Chopin and a set of six “Rock and Pop Grand” libraries. Plus, two KRS libraries feature synth pads and leads, respectively, using the astonishing sound-generation capabilities of the KRONOS’s EXi. All the new KApro libraries are on sale at introductory prices until October 31st, 2014.